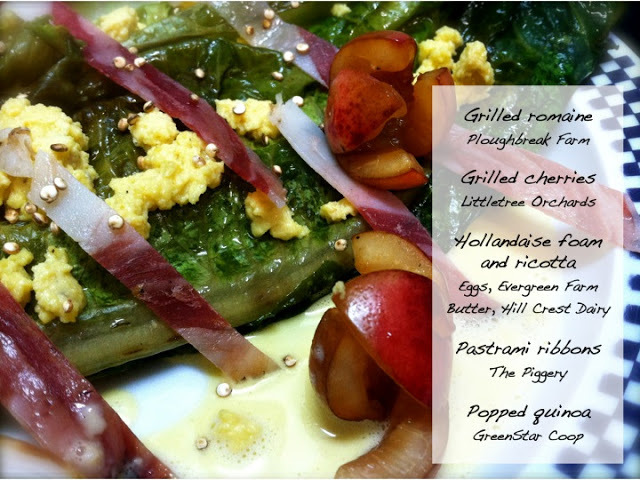 VOTE HERE: Grilled Romaine and Fruit Crepes, with Hollandaise Ricotta and Popped Quinoa! My friend Shanti (of Shantilly Picnic) brought the Share a GOOD Recipe Challenge to my attention, an intention that is dear and near to my heart. 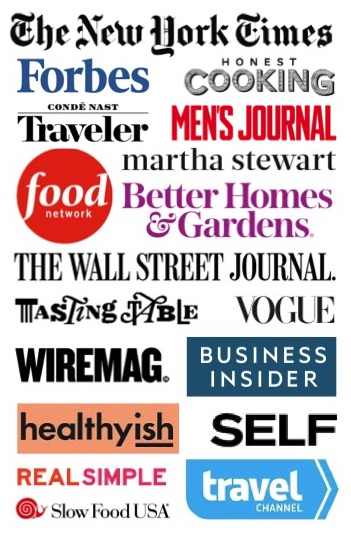 Together we will put forth our best recipes, with a mission to Eat for Equity. 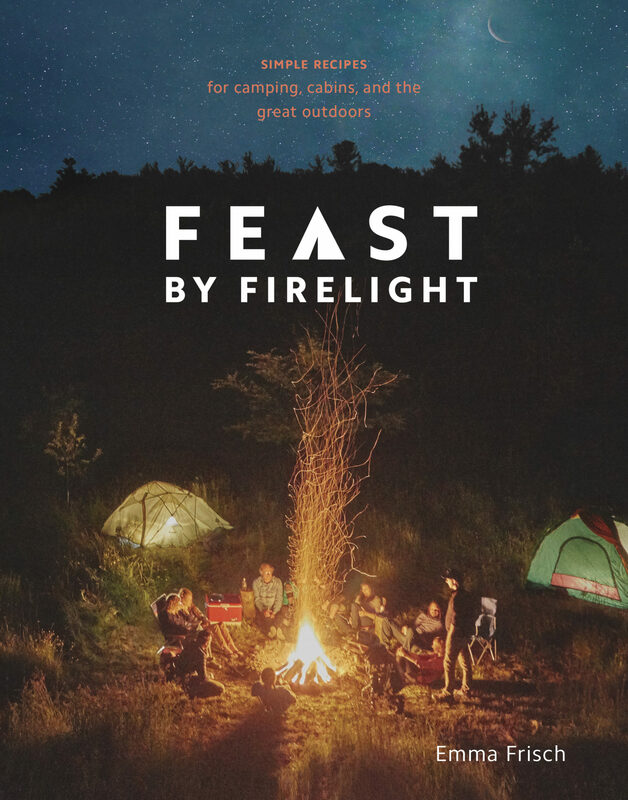 In the past, I have hosted Harvest Dinners, climbed a 20,000 ft. volcano, and labored in the fields to support local farmers and make good food available to everyone in my community, without discrimination. 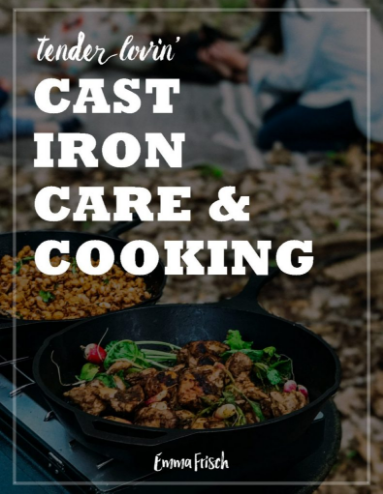 While this recipe has multiple steps, it is incredibly easy, and somewhat shocking in the sense that most of the ingredients are typically eaten raw or cooked otherwise. A good recipe for a slow evening cooking with family, and sipping cool beer in the fading sunshine. This was made possible with my co-cooks and eaters, Shoshi and Paul, who brought applewood chips, visions of popped quinoa, and ambition to the table. Don’t hesitate to include other grilled goodies, like freshly harvested radishes! Soak one wooden skewer per person for about 10 minutes. Slice a cross in the top of your cherries to remove the pits. Try to keep the cherries in tact at one end. When the skewers have been soaked, spear the cherries onto the skewers and set aside for grilling. 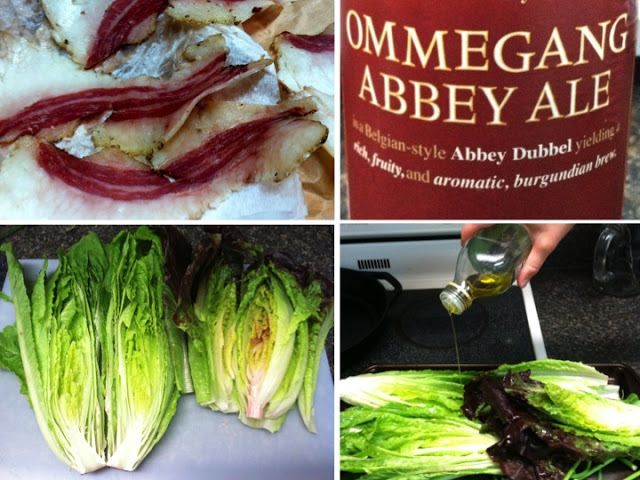 Rinse the whole romaine head and shake lightly to remove excess water. Slice in half, keeping the base of the stem in tact. 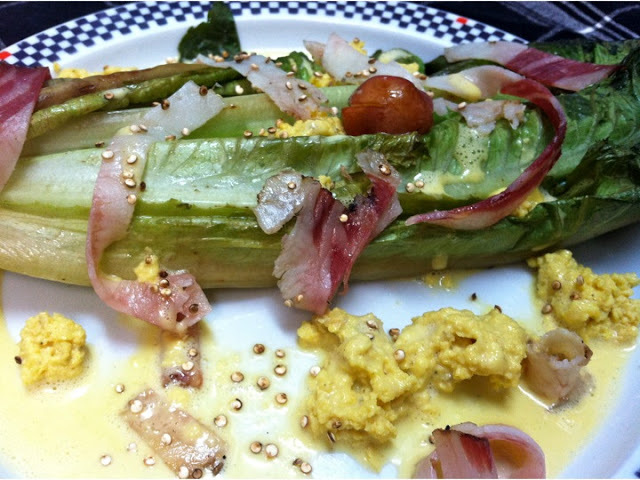 Place the romaine and spring onions on a baking sheet; drizzle with olive oil and sprinkle with sea salt. When the grill or fire pit is ready, place the cherry skewers, romaine and spring onions on the grill and cook until they are charred. The romaine will wilt slightly. 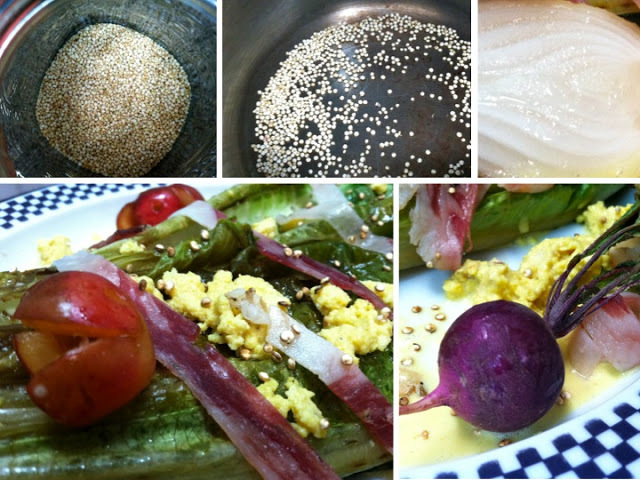 Remove and set aside, keeping warm (perhaps in the oven or covered with foil) while you prepare the hollandaise. Optional: Soak about 2 cups of applewood chips in water for about 15 minutes. 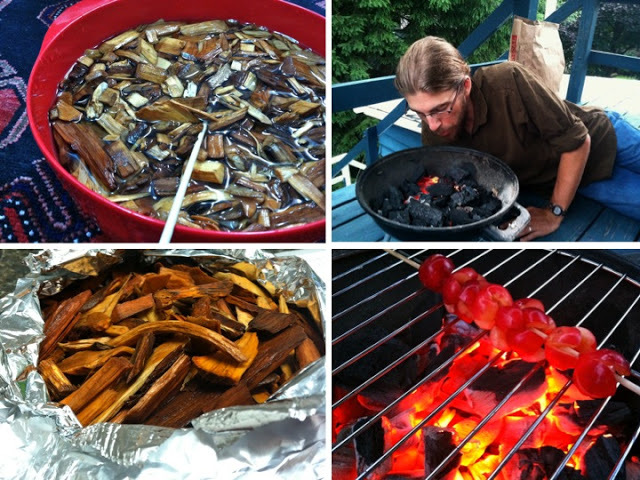 When the vegetables are ready, you can prepare your applewood chips if you plan to use them. Drain the water and place the chips on a sheet of foil. Wrap the foil around the chips so that it lines the edges, creating a square-shaped basket. Leave the chips exposed through a square opening about 2 inches by 3 inches on the top. Place the packet of chips on top of the coals, with the exposed chips facing up. Heat a dry, small saucepan. You want the pan to be quite hot (but careful not to burn the bottom). Add the quinoa and immediately begin shaking the pan. The quinoa will pop and sizzle. As soon as it becomes aromatic and toasted in color, remove from heat and put in a separate bowl. Set aside for topping your final dish. Inspired by Mark Bittman's Hollandaise recipe in "How to Cook Everything"
Heat a small pot of water. When the water is boiling, remove from heat and nest a small bowl in the pot, so that it rests on the edges of the pot and does not submerge in the water. (You can use a double boiler). Melt the butter in a small saucepan (or microwave), being careful not to burn it. 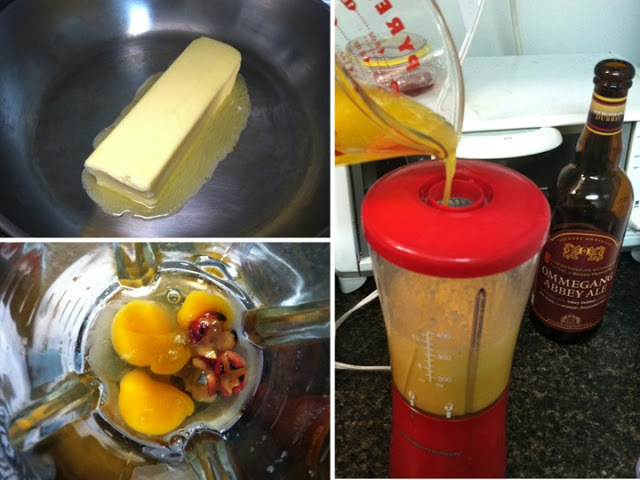 Add the butter, raw eggs, sea salt, dry mustard powder, and lemon juice to a blender. Whirl together for about 2 minutes, pureeing thoroughly. Put the pureed sauce back into the sauce pan over medium-low heat. While it begins to heat, use a spoon to skim the foamy surface of the sauce into the bowl resting over the hot water. 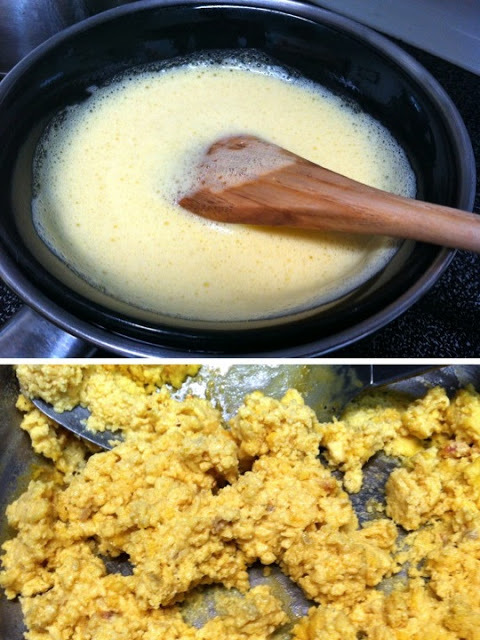 Stir the remaining sauce until it begins to look like creamy scrambled eggs. Remove from heat. 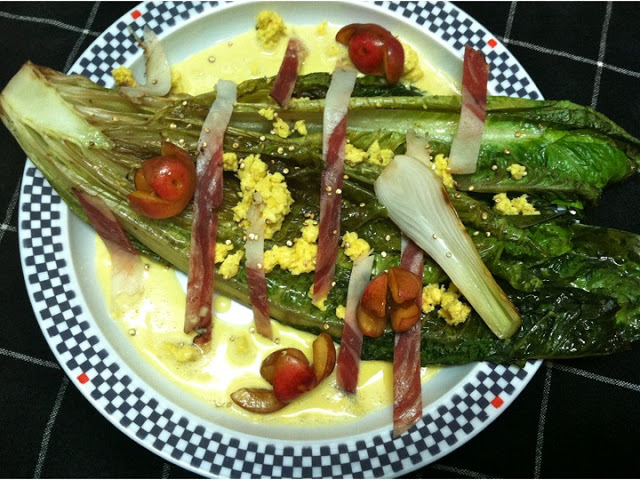 Center the grilled romaine and spring onions on a plate, and top with hollandaise ricotta, pastrami ribbons and grilled cherries. Drizzle the hollandaise foam around the edges of the plate, creating a shallow bath for the romaine. To serve on crepes, follow this recipe.